Once again the event is indoors! No more writers melting in the park! The seventh annual Writers in the Park will once again be indoors, but is still at Kirkwood Park. We've taken over the second floor of the community center and expect an exciting day of events. Multiple writer tracks for adults, a workshop for young writers, and a book room filled with local authors. Best of all it remains free and open to all writers, no pre-registration needed. George Sirois, T.W. Fendley, Meredith Tate, Peggy Nehmen, Barry Cozaihr, Sarah Cozaihr, The Write Pack, Brad R. Cook, and David Lucas. Plus books by St. Louis Writers Guild Members, and the speakers! 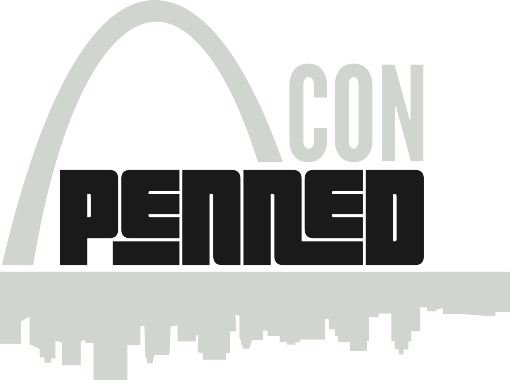 Find out about next year's exciting news - Gateway Con! A Workshop for Young Writers in 4th-8th Grade starts at 10am! Learn about the Young Writers Awards a writing contest held by SLWG. A complete schedule is below, and bios are available on the website. There is always a Book Fair at Writers in the Park! With the returning promotion - "Buy a Book, Get a Sandwich." Come check out all the books! The Schedule for Writers in the Park 2016! Foreshadowing… what could be coming in this article… we’ll have to find out. Foreshadowing is defined as a warning or indication of a future event. A dramatic device used to inform the reader that an important plot-point will return later in the story, in a significant way. In television it will be accompanied by rousing music like… dun, dun, duun. Foreshadowing is a wonderful way of teasing the reader. Arousing a sense of wonder, and making the reader ask questions, or develop their own theories of what is coming. Foreshadowing comes in two important parts, one scene or line that teases the future, and a scene or line later with the promised payoff. A false buildup can anger the reader, leaving them longing for a scene that will never come. Usually, foreshadowing will happen in the first act of a book, but it can happen in the second act, or even the beginning of a chapter. The important point is to leave the hints before the significant scene. On a personal note, I love when writers elude to something early on in a book and that gets paid off much later in the story, it builds a sense of having come full circle in the story. The best foreshadowing drops hints as to what the important plot-point will be. Truly great writers will drop enough hints that the reader can’t figure out what is coming, but once the plot-point has happened the reader will remember the foreshadowing and all will become clear. A foreshadowing scene or line can come any time before the significant plot-point. From the beginning of the book all the way to right before the reveal. Tease the future to your audience. With too many details, the reader might figure out the plot-point before it arrives. Yes, most will continue reading to see if they are correct, but if the reader can figure out what is coming, if they figure out the big reveal before the writer unveils the scene, disappointment can ensue or worse, they could stop reading. A single line might be all it takes to foreshadow what is coming, maybe even something as simple as the weather. Keep the foreshadowing simple and the reader will appreciate not giving it away. Foreshadowing is a device that is best used sparingly. Overuse would be a tad ridiculous. Imagine a book where every little detail is foreshadowed. The writer would spend as much time eluding to what was coming, as they would be revealing the plot. Select the moments that create the most impact, like the climax, or a significant plot-point, but there is no need to foreshadow every event. You can even foreshadow the twist of the book. The important thing to remember is to not elude to every event in the book. Foreshadowing gives the important moments even more emphasis. 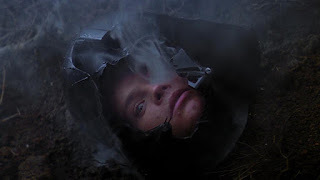 One of my favorite moments of foreshadowing came in The Empire Strikes Back, Luke sees his face in Vader’s mask on Dagobah and later finds out Vader is his father. Though as Anna Kendrick points out in Pitch Perfect, Vader means father. What are you favorite foreshadowed moments in books or movies? Let us know in the comments. Learn the why’s and how to’s of audiobooks from authors George Sirois and T.W. Fendley, who will share their different paths to creating audio versions of their novels as keynote speakers at the seventh annual Writers in the Park. 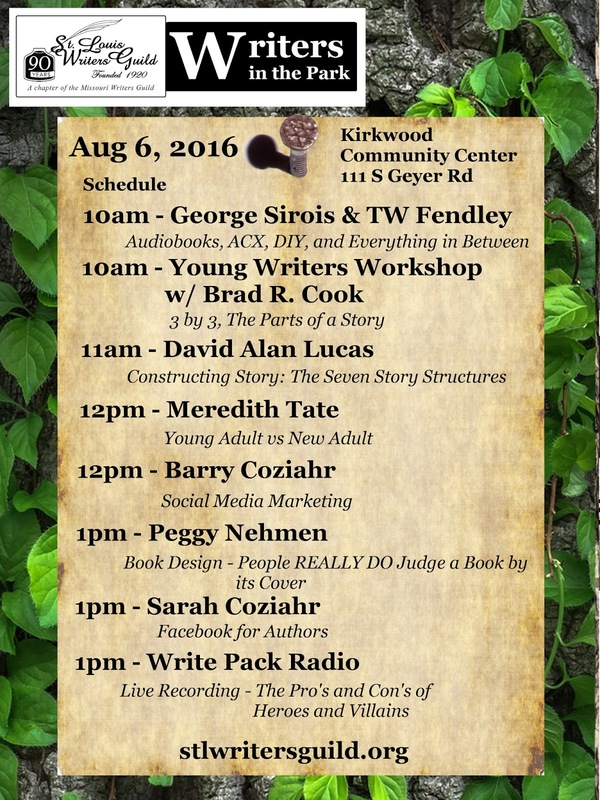 The free festival for writers will be held indoors from 10 a.m. to 2 p.m., Aug. 6, at Kirkwood Community Center, 111 S. Geyer Rd. It will feature multiple writer tracks for adults, a workshop for young writers (4th-8th grades), and a bookroom filled with local authors. The popular “Buy a book, get a sandwich” promotion will return, featuring sandwiches from 6 North Café. Best of all, the conference remains free and open to all writers, no registration needed. Workshops each hour will focus on topics such as social media marketing, using social media for writers, Young Adult vs. New Adult, publishing for Kindle, and the craft of writing. 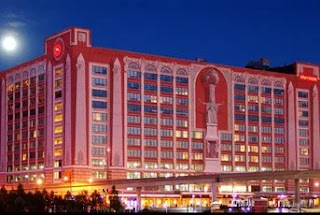 Authors and publishing professionals scheduled to appear include, George Sirois, T.W. 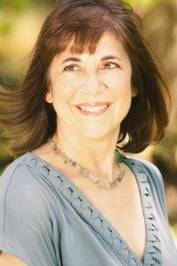 Fendley, Meredith Tate, Barry and Sarah Coziahr, and Peggy Nehmen, with more to be announced soon. Plus, stop by the local author book fair and learn about the Gateway to Publishing Conference and Convention hosted next June by the St. Louis Writers Guild. In the keynote presentation entitled “Audiobooks: ACX, DIY, and Everything in Between,” George Sirois will share his step-by-step journey to create a digital audiobook. Sirois is the author of the science fiction novels EXCELSIOR and FROM PARTS UNKNOWN. www.georgesirois.com. Learn more about the St. Louis Writers Guild and Writers in the Park at www.stlwritersguild.org.